For the record, I love lousy weather, the worse, the better. I'm not the type to sit at home and wait for the April showers that bring May flowers kind of weather. I'll be on the road punching through the squalls coming off Lake Erie in December or January or I'll be that guy busting out huge sections of ice to open up some water. Sitting at home doing nothing isn't an option. Lousy weather has its benefits and biggest one is crowd control. The majority of anglers along the Alley are generally considered the fairweather variety. They only venture out when it conditions are perfect. There's nothing wrong with that, as I welcome the days when I don't have bundle up and constantly blow on my frozen hands. Weather along the Alley can turn at moments notice, especially during the winter. The biggest culprit is lake effect snow. Cold winds from the north or west blow across the warm waters and as they often do. Along the way moisture gets picked up. It's a unique phenomenon, because certain areas along the lake get more snow than others. I live on the westside of Cleveland and we usually don't get as much snow because of the winds. Drive 20 miles east towards Lake County and they can get socked with a ton of snow. That's the case pretty well all the way to Buffalo, New York. When one of these lake effect snow hits, it can be a white knuckle drive, even in a 4X4. You can barely see in front of you and then 20 minutes later, you come out it out and the sun is out. The same can be said when fishing as there's been times when I can barely make out the float. As for people? Most of time, I'll have entire stretches of the river to myself. Nothing is more satisfying then working a stretch and not having to worry about someone encroaching in your spot. That's probably why I enjoy winter steelheading, because it separates the boys from the men. The same be said about rain or even the threat of it. I have the luxury of living 10 minutes away from one of the rivers. Depending on when it rains, I simply hop in the car and drive down. Someone living 2 hours away, isn't going to roll the dice and make the drive out. When it's raining, the window is just open enough, but it will close quickly if it becomes. The smaller streams will be the first to blowout. That's where the USGS flow data comes in handy. It can be used a tool to determine what's the best option to fish. If the rain has occurred in the early morning hours, then I'll fish the Grand. 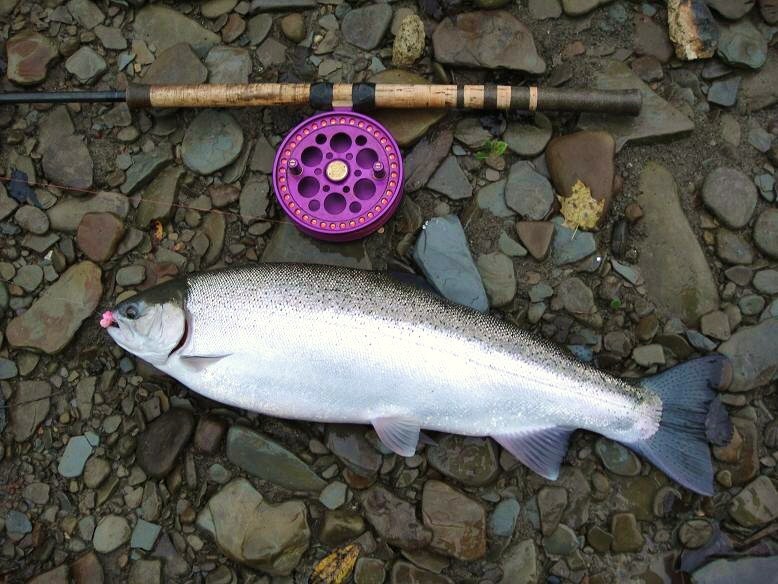 The Grand is the largest of the rivers in Ohio that get steelhead. It takes sometime for it to completely blowout.